Part two in our series dives deeper into the recent switch to HD by Bloomberg Television and how “smart imagery” is used to show data and analysis. John Newhouse, creative director for Bloomberg Television, talks about the elements created and how the overhaul compares with other business networks in part two. How many elements were produced and for how many shows? All the concepts and elements were produced by Bloomberg Television’s own in-house graphics team. Did this make-over include every show on Bloomberg? We completely redesigned the style, transition wipes and network bumps for Bloomberg Television’s morning programming, including “Inside Track with Deirdre Bolton and Erik Schatzker” (6-8am/ET), “In the Loop with Betty Liu” (8-10am/ET) and “InBusiness with Margaret Brennan” (10-12pm/ET). We also re-did “Street Smart” (3-5pm/ET) which is our signature show at market close, hosted by Matt Miller and Carol Massar. 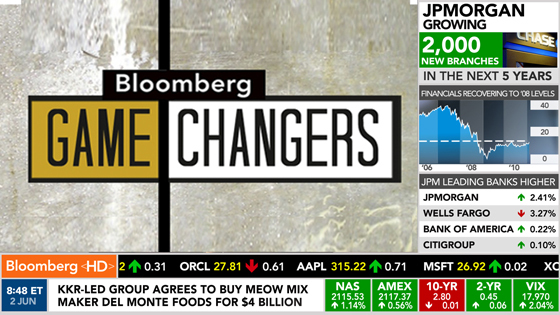 How do the new graphics fit with the shows pacing and style on Bloomberg? 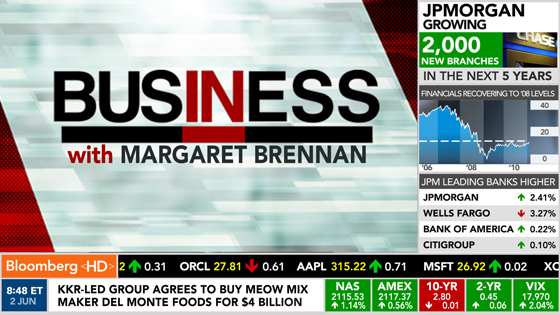 The new graphics reflect the pace and energy of Bloomberg TV. Bloomberg Television is known for its worldwide coverage of breaking news, business, politics, world events and the global economy. Our graphics reflect the full span of what we do here. How would you compare this package with other business news channels? Bloomberg Television looks completely different from the competition. We’re grabbing viewer’s attention through smart imagery rather than over-the-top, ostentatious design. We’re also displaying more data on the screen, pulling that information from Bloomberg’s worldwide news service and financial data and analytics. Plus, we’re the only business TV channel using color-coded market indicator chips and other features. Along with graphics, were any sets or music packages changed? 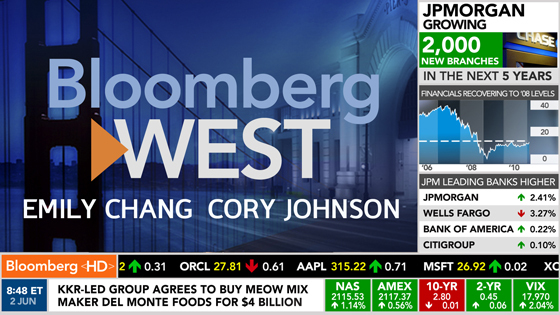 Bloomberg Television has had new, interactive sets in place since 2009. We are taking advantage of these new sets and we added new music for “In the Loop with Betty Liu” and “Street Smart with Matt Miller and Carol Massar” to coincide with the redesign. Bloomberg HD has a very clear objective: enhance the viewing experience for current users and attract new viewers with a superior screen product. Thanks to John for taking the time to answer our questions. If you missed part one, you can read it here. Also, a full gallery is available in the graphics section.